Nintendo has been around for a very long time, since the late 1800's in fact. They were a playing card company before they were a game publisher/developer and console manufacturer. Then in the 1980's they pulled the US gaming industry out of its big crash and propelled gaming to where it is today with no signs of stopping. 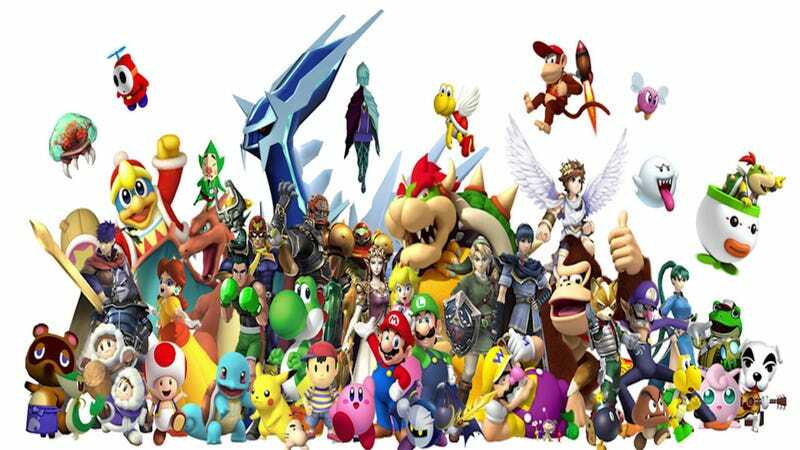 A big part of Nintendo’s success is its very large stable of first party franchises. However, unlike Sony and Microsoft, Nintendo had two platforms to support(Sony did too with the PSP and Vita, but they’ve now consolidated what few first party handheld exclusives they had onto the PS4.) and that meant spreading its IP’s out amongst their two platforms for any given hardware generation. But that changes this year with the Nintendo Switch which combines Nintendo’s two platforms into one. All of their first party franchises are now under a single roof and these are the franchises you can expect to see on the Nintendo Switch at some point during its lifespan(And also some franchises I hope to see return to the front.). I wanted to get the obvious one of the way first. Zelda is one of Nintendo’s oldest IP’s and it has persevered throughout Nintendo’s ups and downs. We are on the verge of Breath of the Wild’s release this March and it’s more than likely the most highly anticipated installment in the franchise. Interest in the series is higher than ever and the game is coming to both Wii U and Switch(Release timing for Europe is up for debate though.) meaning that no matter which system you own you’ll be able to play this game. This is merely the first Zelda game for Nintendo Switch and I’m sure it won’t be the last provided Switch does well. Now, you and I both know that it wouldn’t be a Nintendo system without the obligatory Mario game. Mario is Nintendo’s mascot, just like how Microsoft has Master Chief, Sega has Sonic the Hedgehog, and Crash Bandicoot was once the face of Sony. People complain that there are too many Mario games or that too many of them recycle the same formula, but you can’t deny that Mario has staying power and sales of Mario games are generally high. If you’re like me he was a big part of your childhood and it’s hard to forget something like that and having a trip down memory lane once a year isn’t so bad. As of right now we know there’s a new Mario game in development for the Nintendo Switch which may make it in time for launch, if not within the first three months. Rumors say that it’s sort of a blend of Super Mario 64 and Super Mario Sunshine, which doesn’t sound so bad. Donkey Kong is old, older than Mario in fact and the origin of that character. In recent years the Donkey Kong series has seen renewed interest with Retro Studio’s revival of the Donkey Kong Country series. DK never left the Nintendo stable even during the rough years, but he’s back in the spotlight and it’s safe to say that Nintendo will keep making Donkey Kong games and ride the momentum as far as it can, seeing a Donkey Kong Switch game is inevitable. Metroid is in a bit of a strange place right now. The series was bigger than ever after the Prime trilogy that ended in 2007, however, Metroid: Other M released to less than stellar reviews. Some praise here or there, some hatred elsewhere, and optimism in a few places. Needless to say though, the momentum died with Other M and a major Metroid game has not released since. It did not grace the Wii U with a proper entry and in its place we got a 3DS game that no one really cared about. However, in that little spin-off we got a tease suggesting that the big Metroid games, Prime in particular, are not dead, and could be coming sooner than we expect. I’ll put my non-existent money on Metroid Prime 4 being a Switch title due to be released sometime in the next year or two, and if it continues the trend of humanizing Samus I’ll be all for it. Just... please do a better job than Other M did. Splatoon is the youngster hanging around with all the old farts. It’s Nintendo’s latest first party IP and was a smash hit. Nintendo was overdue for a new series and Splatoon was just what the doctor ordered. The Switch reveal trailer showed us glimpses of Splatoon and eagle-eyed viewers noticed graphical improvements over the Wii U version suggesting it was more than a promotional move. Splatoon is coming to the Nintendo Switch in the form of a remaster, and it wouldn’t be too far-fetched to assume a Splatoon 2 is on the horizon. It could be this year, it could be next year, or the year after that, but it’s going to come so long as Splatoon remains popular. Okay, so Star Fox Zero wasn’t exactly a smash hit, so much so that not even Platinum Games pedigree could save it, but that apparently isn’t going to deter Nintendo. Shigeru Miyamoto stated that Star Fox will return in the future despite Zero’s less than stellar performance and that’s nothing but good news. And you can rest assured that it won’t have clunky motion controls or second screen gameplay. The Switch doesn’t support the latter and the former is unlikely, not because the Joy-Con’s aren’t capable of it, but because the game needs to be able to be played without motion controls for when the controllers are docked to something. The next Star Fox game will be different and I have feeling it will go over a lot better with gamers than Zero did. I just recently finished Pikmin 3 and instantly fell in love with the franchise. I may never get to play Pikmin 1 & 2, but I can rest easy knowing that a Pikmin 4, whether it’s the rumored reboot or a sequel, is being made and will release on the Nintendo Switch. Miyamoto has said its coming so I’ll hold him to his word on that one. Though I will admit the lack of second screen functionality will be weird in this one instance as I can’t imagine playing Pikmin 3 without it even though that option does exist. It just felt weird. Kirby is cute, and while he’s bounced back and forth between handheld and console, he’s been there for Nintendo over the years and that is highly unlikely to change for the Nintendo Switch. Kirby will appear with a brand new adventure and bring his unique brand of charm with him. Yeah, I know, technically a Mario game, but Mario Kart has now had eight main installments, it is a series all its own separate from the main Super Mario titles. Mario Kart 8, by itself, boosted Wii U sales and so it has a place on this list as one of Nintendo’s best first party offerings. Many of us have fond memories of tossing blue shells at our friends as kids and I highly doubt that joy will disappear with the Nintendo Switch. This one is here just for the sake of it. It has had many, many installments over the years and has brought me and many others years worth of fun. Granted, I feel like the series went downhill after Mario Party 5, especially with the new cooperative schtick they’re running with. Mario Party was at its best when it was ruining friendships during the N64 era, and my hope is that Mario Party 11 returns to that classic formula and ditches the dang car or whatever other vehicles Mario Party 10 had. I smash, you smash, everyone smashes at some point or another and Nintendo knows when it needs to smash. The original Super Smash Bros. was great on the N64, Melee was even better, Brawl was good, and Wii U/3DS was also great. Rumor is Smash 4 will be ported to Switch. Great! Now where’s the next Smash Bros. game? I know it’s coming. The new direction that Fire Emblem games have gone since Awakening has not gone over well with everyone, but it’s hard to deny that Awakening put Fire Emblem back on the map. However, that came at the cost of Fire Emblem becoming a handheld IP exclusively, limiting its reach. That changes with the Nintendo Switch, allowing the newer Fire Emblem games to reach a console audience and with the massive power boost over the 3DS, they could possibly even bring normal gameplay graphics up to the quality of the pre-rendered cinematics. Fire Emblem Fates was a success and it would be foolish of Nintendo to stop there. Fates released in 2014 in Japan, which means that it’s about time for the reveal of the next Fire Emblem game. Game Freak has gone on record statint that Pokemon belongs on handheld because you can take it on the go with you and battle other players anywhere you go. And also because Pokemon means Pocket Monsters, so, yeah. Once upon a time we got two basic Pokemon RPG’s, Colosseum and XD: Gale of Darkness, on the Nintendo GameCube. After that we never got another one. We got a battle arena game on Wii and an admittedly good fighting game on Wii U. But the spin-off nature of console Pokemon games ends this year. The Nintendo Switch is both a handheld device and a home console. With the portable nature of the system the Nintendo Switch will see a proper Pokemon RPG in its lifetime. Full support will of course depend on sales of the Nintendo Switch according to Game Freak, but rumors suggest that they’re currently developing a combined version of Sun & Moon for the Switch using higher quality assets. If the Switch sells well(And believe me when I say it will just from having a Pokemon game on it. Pokemon is a console seller. ), you can believe the next Pokemon will likely be a Switch exclusive as Game Freak has never done cross-generation Pokemon games in the past. Diamond and Pearl ditched the Game Boy Advance, and X & Y abandoned the DS. Game Freak now has the power of a home console at its disposal and that makes me excited to see what they could do with it. Note: I understand that Pokemon is not a Nintendo created franchise. However, it has made a permanent home on Nintendo systems, Pokemon Go not taken into account, and so at this point it might as well be a first party title because Pokemon games are generally associated with Nintendo when you think about them. Animal Crossing is one of those popular series that I haven’t played, but I kind of want to because of all the jokes people make about it. Like, on the surface it seems really cutesy and simple, but I constantly hear people tell stories about the more recent games that paint it as being not quite what it appears to be. I might get New Leaf for the 3DS, or I might wait for the inevitable new Animal Crossing game on Switch. The Nintendo faithful have been clamoring since the GameCube for a new F-Zero installment, and while Nintendo has acknowledged the demand, they have yet to do anything about it. Their official statement was that they didn’t want to just do a repeat of GX, they wanted to do something new with a new F-Zero game, but I imagine fans would be happy with anything at this point and as the Mario series proves Nintendo isn’t entirely against rehashes if it works. The Nintendo Switch can be seen as a new chapter for Nintendo, what with them going back to their red and white logo of old, so it’s only fitting that they begin reviving dormant franchises like this racer. Mother/Earthbound is a series that I have never played, maybe I should, I sort of want too because Ness is cool in Smash Bros, but with how old the games are it’s sort of difficult for me personally to go back and play those. I’ll be straight with you, this one is here because I know people want a new game, or at the very least they want a re-release of Mother 3, particularly in the US. It’s also here because it’s a first party series and I want you to know it exists. Nintendo has so many IP’s and Mother is one of those older series that is fondly remembered, but Nintendo has not seen fit to release anything new. The creator of the series has repeatedly said he will not make a Mother 4, but that doesn’t mean Nintendo can’t put someone else on it(But that might not be advisable.) and Switch is where it will end up if it ever happens. Speaking of old franchises, we have Ice Climbers. Have you played it? I haven’t. But I know of it thanks to Super Smash Bros. Melee and Brawl. They’re interesting characters and I can imagine the platforming possibilities if Nintendo were to make a modern Ice Climber game. Now, the Ice Climbers were absent in Super Smash Bros. Wii U & 3DS due to processing limitations on the 3DS so it is entirely possible that any interest that these two characters generated from being featured in Melee and Brawl may have diminished, but I know I want to see a new game and I imagine I’m not entirely alone on that. The game has been re-released Wii, Wii U, and 3DS so perhaps it’s still in Nintendo’s mind. Only time will tell if they decide to do anything with the IP. Punch-Out!! is a boxing game and a bit comedic in its presentation, but I’ll admit that I’ve never played it. The most recent release was on Wii so I really don’t have an excuse to have not played it. That being said it’s under the revival section because it completely skipped Wii U and didn’t even get a handheld entry on the 3DS. When a franchise skips an entire generation, ti begs the question as to whether or not it will ever reappear. Now, to be clear, this is not the first time Punch-Out!! skipped a generation. It skipped the Nintendo 64 and the Nintendo GameCube before reappearing on the Wii, and now it skipped the Wii U. It could return for Switch, it might not. This series comes and goes as it pleases, but it would be nice to have something a little different compared to Nintendo’s other series. Nintendo has a massive stable of first party exclusives, but lately they’ve accumulated a pretty solid second party exclusive slate. Not least of which is the Xeno series. Xenoblade on the Wii was a surprise hit and a massive fan campaign got it brought stateside. That significant amount of interest and success led to Xenoblade Chronicles X on the Wii U which is an impressive game. Now that game has been out for over a year and Monolith Soft has moved on to their next game. The rumors are a bit unclear as to what exactly it is they’re working on, be it a new Xeno game or something else entirely. What is known is that it is a Nintendo Switch game, further cementing Monolith Soft’s relationship with Nintendo. The first three Fatal Frame games were PlayStation titles, but the fourth and fifth titles were released on the Wii and the Wii U respectively, showing a chance in allegiance on the part of Koei Tecmo. Whether that will hold up for the Switch is up for debate, but if it remains intact, I could see a Fatal Frame VI coming to Switch in the future. Since Persona has left the Shin Megami Tensei stable to be its own thing, that leaves Shin Megami Tensei as a second party Nintendo series. Shin Megami Tensei IV and Shin Megami Tensei IV: Apocalypse can only be played on the Nintendo 3DS and Shin Megami Tensei: Strange Journey before that on the DS. Atlus shows some favoritism for Nintendo when it concerns the main Shin Megami Tensei series. If that continues, then Shin Megami Tensei V will likely appear on the Nintendo Switch exclusively. And this is where I will end this massive list. I’m fairly certain I forgot some first party and second party franchises(One off games don’t count.) so feel free to correct me in the comments below. I just wanted to point out just how many franchises Nintendo has in its pocket that they could easily whip out for the Nintendo Switch. It’s a huge stable, one that only Sony can hope to match in terms of sheer size. Only time will tell if Nintendo releases even half of these and if the second party series stay, but one thing is certain: The Nintendo Switch will not see the same kind of game drought that the Wii U did. There are just too many games now for that to happen.